Keeping Your Cats Safe Outdoors, Well….Indoors? – The Cat Next Door Inc. 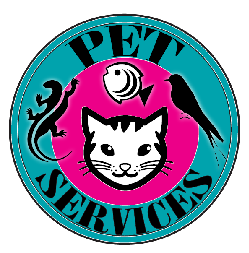 The Cat Next Door Inc.
Pet Sitters and Certfied Feline Specialists. Meet Airdrie's Catpanions! Keeping Your Cats Safe Outdoors, Well….Indoors? It seems like every day we hear about another lost cat in our community. The social media sites are full of pages dedicated to people finding their lost cats, and the ones that are the most frustrating are the ones that are completely preventable. It’s true that there are many things that cats love about the outdoors, but there are even more things out there that cause stress and anxiety for your cats, not to mention outright dangerous situations. What are some of those dangers? Getting run over by a car, adverse weather conditions, being intentionally poisoned by cat-haters, being accidentally poisoned (a good example is antifreeze – it’s very poisonous to cats but they are drawn to it), exposure to other harmful chemicals, contracting viruses, or catching parasites such as worms, being accidentally locked in a neighbors shed or garage, being attacked or killed by dogs, owls, or coyotes , or being abused or killed by a cruel person, to name some of those dangers. All of the things that the cats enjoy about the outdoors can be provided to them by their cat parents, safely. To satisfy the hunter in your cat, dedicate quality play time with your cats. A toy resembling a bird or mouse attached to a long wand is a great activity to enjoy with your cats. Just make sure that the toy is structurally sound and that you let your kitties catch their prey a few times so the game is satisfying for them. 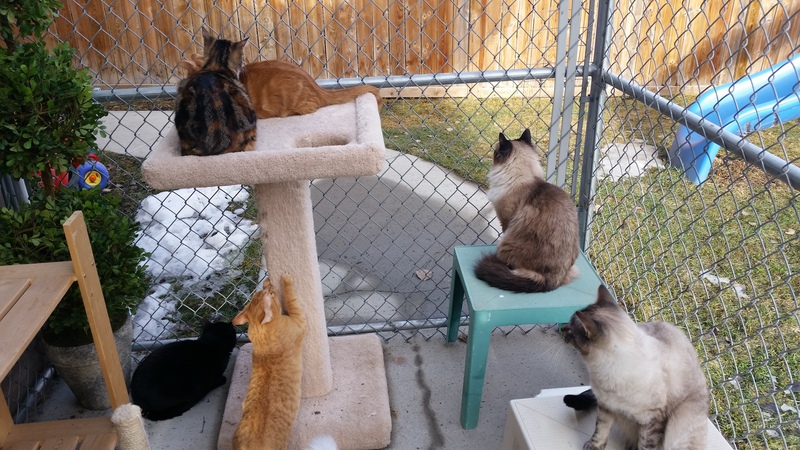 As for actually letting them go out and enjoy the fresh air, consider investing in a “catio”. If you have a house, dog runs can be modified to make nice, sturdy outdoor cat play areas. If you live in an apartment, maybe a smaller screened off area is more applicable, as long as it is not fabric screen material. You don’t want something that kitty can easily tear through with her claws. Heavy gauge, galvanized fencing material makes for a more solid choice to keep your pets safe from the dangers of the outdoors. 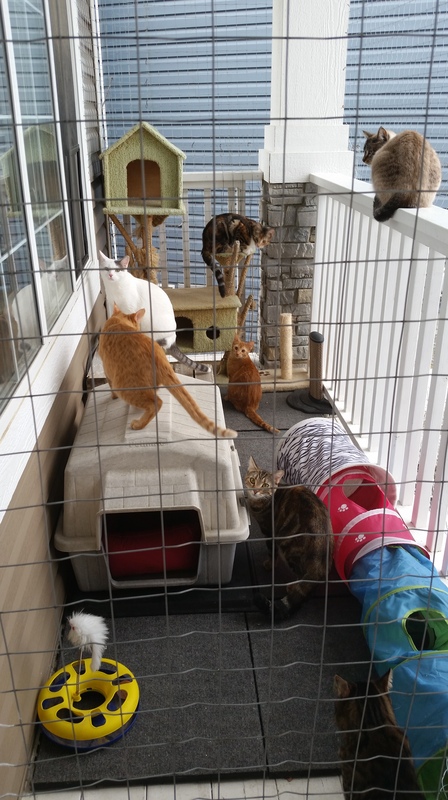 The style of home you have, whether you live in the country or city, and the local bylaws in your community will define the limits on what you can provide for a catio for your kitties.